On our way to our final @propelwomen Activate Event for the year, and I am SUPER-PUMPED!! Y’all are coming out in force. Your trust and support of me & our collective vision to help women internalize a leadership identity means the world. This “collective vision” of helping women “internalize a leadership identity,” of course, is the main attraction. Because we know that the Scriptures repeatedly call women to be leaders in the workforce–it’s what Jesus bled and died on the cross for. Of course, that’s sarcasm (for those who may be questioning my motives here). However, it appears that the precarious pastrix of Hillsong, Australia actually just might believe that. So many of you have selflessly cheered us on, participated, and contributed to the stunning story that is unfolding. Jesus is the heartbeat, his word the foundation and mobilizing women to be salt and light in their world the goal. I’m praying that lives will be transformed, bodies healed, souls saved, and thousands of women will be activated and propelled into their God given purpose. I’d love you to pray with us and for us, these are significant days on the earth. God bless Christine Caine. She was able to squeeze in a “souls saved” there in that list of things she’s praying for. But most importantly, she’s praying that “thousands of women” will be “activated and propelled into their God given purpose.” Because, you know, these are significant days on earth and stuff. So what exactly is this “God-given purpose” she refers to? Well, there’s a vague reference to “purpose” on their website that obscurely cites 2:10. Um, no. Christ is the “driving force” (if you want to use that terminology) behind what He alone has called us to do. And what He has called us to do is obey Him (John 14:15). That includes, for example, following the teachings of Scripture that prohibit women from preaching and holding the office of pastor (1 Timothy 2:12). Scriptures that teach that twisting the Word of God to draw disciples after yourself is a big no-no (Acts 20:30). And Scriptures that teach that preaching any other Gospel other than the one taught in Scripture will land you into destruction (Galatians 1:8-9). All these things Christine Caine regularly engages in. Christine Caine along with her accursed cohort, Joyce Meyer, are unabashed prosperity gospel charlatans that have been preaching a false gospel, twisting God’s Word, and usurping the biblical role of men for years. This has been well-documented here and here and will not be re-hashed. However, we can safely say that this female festival of falseness will be more of the same shenanigans, and the conference and the speakers should me avoided altogether. Oh! 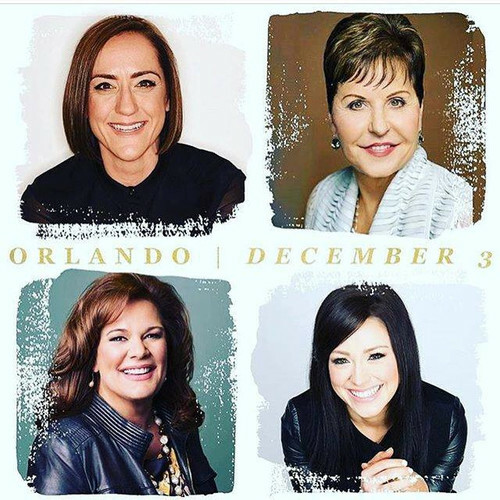 What a wonderful idea ….. Christine Caine, Joyce Meyer (and all these women who are preaching in contravention to Gods’ word) packed inside a silver canister and propelled into space …….. with not enough fuel to get back! I can’t think of anything that would benefit the Body of Christ more. This rubbish is just so RIDICULOUS but unfortunately very lucrative for these charlatans! I saw a TV program with Joyce Meyer speaking. Almost instantly I knew something was wrong ! I was away from the Lord for over 20 years yet his spirit never left me.